Increased tuition fees do not necessarily result in a decline in overall enrolment. Although a $1000 dollar increase in 1992 dollars has been found to result in a 2.5% to 5% decrease in overall enrolment in the United States of America. (Coelli) Studies of Canadian universities have found mixed results, some have found there to be a drop in enrolment as tuition rises, but the drop is usually fairly small. Although a rise in tuition fees may appear to have negligible consequences on overall enrolment, if that enrolment is analysed in terms of household income then significant changes in the makeup of the student body can be seen. Michael B. Coelli, of the University of Melbourne, used data from the Survey of Labour and Income Dynamics in order to obtain information on parental income for university applicants in Canada. Coelli found that an increase of $1000 in 2000-1 Canadian prices to tuition fees did not result in a significant decline in overall tuition. What a $1000 increase to tuition fees did do however, is widen the gap between the enrolment of students from low-income families, and the enrolment of students from high income families. Coelli estimates that an increase of $1000 caused enrolment from low-income students to fall 13 to 17 percentage points relative to the enrolment of high-income youths. As tuition rises, low-income youths become increasingly deterred from entering university, while tuition increases have had little decline or even positive growth on middle-income and high-income youths. 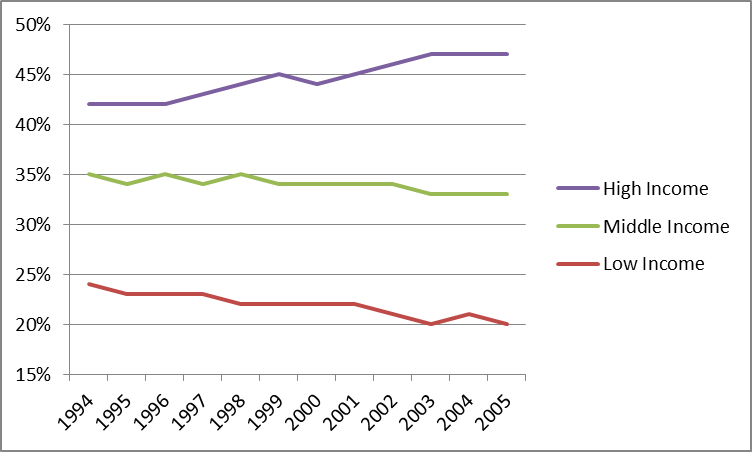 This graph shows the percentage of students enrolling from high, middle, and low income families out of total enrolment in Ontario between 1994 and 2005. Dooley, A. Abigail Payne, and A. Leslie Robb from the Department of Economics at McMaster University built on Coelli’s work. They used the 2001 census to determine the number of potential post-secondary school applicants in Ontario when linked to a neighbourhood’s income level. In total, 40% of potential applicants came from low income neighbourhoods, 25% came from middle income neighbourhoods, and 23% came from high income neighbourhoods. Actual enrolment came disproportionately from high income neighbourhoods. In 1994 24% of enrolment came from the low income group, 42% came from the high income group, and the remaining 35% came from the middle income group. This enrolment gap between students from low income and high income neighbourhoods only increased over time. By 2005 student enrolment from low income neighbourhoods had declined to 20% of total enrolments, while students from high income neighbourhoods rose to 47% of total enrolments, and enrolment of students from middle income neighbourhoods dropped 2% to 33% of total enrolment. In just over a decade the enrolment gap between students from low income neighbourhoods and high income neighbourhoods grew from 18% to 27%. These numbers are not as dramatic as Coelli’s estimate, though they are still significant. From these findings, a rise in tuition fees of 10% was estimated to have a 19.3% increase in the enrolment gap between high income and low income students in arts, and as only a 2% increase in sciences. While the two estimates differ in the exact impact that an increase in tuition fees has enrolment both estimates reach a similar conclusion. An increase in tuition fees will result in lower enrolment from low-income students relative to that of high-income students. Post-secondary education has many benefits, such as access to better paying jobs. That education is becoming unaffordable is a sign of lessening equality in Canada, as well as a more rigid class structure where low-income households cannot afford the education with which to secure higher paying jobs. Coelli, Michael. “”Tuition Fees and Equality of University Enrolment.” The Canadian Journal of Economics 42. 3 (2009): 1072-1099. Martin D. Dooley, A. Abigail Payne, and A. Leslie Robb. “The Impact of Cost on the Choice of University: Evidence from Ontario.” The Canadian Journal of Economics 42. 2 (2012): 755-783.